Area rugs are considered artwork for the floor. But with creative license comes a certain amount of pressure. With so many shapes, sizes, textures, colors, and patterns to choose from, how will you pick the right one? We’re here to help. Just keep in mind these 10 tips and have fun with your floors! 1. If you’re working with a small room, try a non-textured solid or lighter-colored rug. Both will make a small room look larger. Conversely, darker rugs will make a large room feel cozy. 2. Tie a large room together by using multiple rugs. Select rugs of different sizes with one being dominant. The patterns can vary, just be sure the colors coordinate. Layering rugs is a popular trend and makes the room feel intimate and dynamic. In the bedroom: Ensure that both parties get a warm wake-up call with a rug that extends three feet on either side of the bed. Smaller rugs placed before dressers or wardrobes can make the room feel cozy. In the living room: Traditionally, the rug should be large enough to fit under the front legs on sofas or chairs or large enough for all of the furniture to sit on the rug. For a more casual look, furniture can sit off of the rug—But it should be the same width of the sofa. In the kitchen: If you have a galley or oddly shaped kitchen, consider a runner or a small rug in front of the sink or wherever you spend the most time. 4. In high-traffic areas such as entryways opt for detailed patterns that won’t show dirt and a high-quality fiber such as wool that is naturally stain resistant and doesn’t flatten easily. 5. Choose a bold rug if you want it to serve as the focal point of the room. If the room has another focal point or a stunning architectural detail (for example a fireplace) choose a solid rug that won’t compete. 6. If your drapes and/or upholstery is patterned you may want to avoid a patterned rug. 7. Patterns are fun, but so is texture. If you feel a plain rug would be a better fit, but want a touch of flair, consider a rug with an interesting texture such as hemp or shag. 8. Are rug pads essential? No. However they will prevent slipping and absorb sound and can also add years of life to your rug, as there will be less friction between the rug and the floor. They will also keep the rugs from damaging your floors. 9. Be sure you check the maintenance requirements before you purchase a rug. Some rugs will need to be professionally cleaned or require specialized cleaning products. 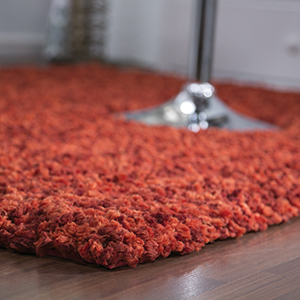 If you have pets or small children, you may want to consider a stain-resistant rug that can cut your cleaning time. 10. Once you have your rug home be sure to rotate it every six months to a year so that it wears evenly.